In 1997, Main Street Point Pleasant realized the importance of having a web presence. A volunteer had just joined the organization that had retired from the computer industry. Although he had been in management and had never done any actual development work, he agreed to take on the task of building a website. 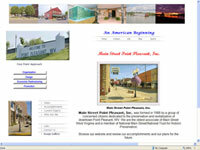 The first release of the site attempted to be "all things to all people" and since this was the first site in Mason County it included information about most aspects of the county including, government, business, education, entertainment, and tourism as well as information about the Main Street Point Pleasant Organization. This first attempt was highly successful and grew in size to be quite comprehensive. As time passed, other organizations decided the information would be easier managed and they would be better served and if they hosted their own site. These sites are now represented in the "LINKS" section of this site. This evolution has continued to the point where the site's mission needed to be reconsidered. The Director has decided this site should now represent only the Main Street Point Pleasant, Inc. organization. A grant was secured and a search was begun for a webmaster that could and would do the major rework within the budgeted resources. Finely, the original volunteer/developer agreed to make the revision. The original site was developed in "FrontPage". In order to comply with many of the W-2 standards, Dreamweaver was selected as the development software. The learning curve is very steep for this application, but over the course of about 30 days the basic framework has been developed and published. You are currently viewing the results of this work. This is a "work in progress". As new techniques are mastered, they will be applied. The original "contract" for this revision consists of developing the basic framework, presenting the Main Street organization's structure, Vision, Mission, Objectives, Accomplishments and Current Projects - based upon information provided by the Director. The ever popular Image Gallery will continue to be provided, but reduced in size, displaying a summary of events and activities throughout the city and county. This initial phase and contract is scheduled to be completed by March 2009.